On Monday Amy tells of our first and so far only visit to the First Aid Station at Epcot. 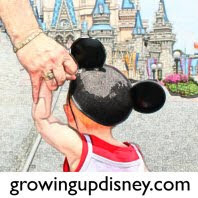 Tuesday brought us a Team Growing Up Disney post. When should you take that first trip to Disney? How old should the kids be? On Wednesday Photo Flashback, yes Virginia, they do exist. It's an illusive crib, that's right no pack and play for you. On Thursday guest post from Janine Pipe of Swindon, England tells how she keeps the magic alive from across the pond.